400x __Diam. 75 µm. 27 Jul 2012. Robert Lavigne. © Robert Lavigne (MicroscopyView.com). Bainbridge Island, Washington, USA; tidal marsh, 400x, DIC. 13 Apr 2008. Karl Bruun. © Karl Bruun (skogenman@earthlink.net). Valve view. Note the distince sectioning of the valva face.. © Robin Raine (Robin.Raine@nuigalway.ie). Actinoptychus senarius (Ehrenberg) Ehrenberg Valve view. Note the distince sectioning of the valva face. Published in: Ehrenberg, C.G. (1843). Verbreitung und Einfluss des mikroskopischen Lebens in Süd-und Nord-Amerika. Abhandlungen der Königlichen Akademie der Wissenschaften zu Berlin 1841: 291-466, pls 1-4. 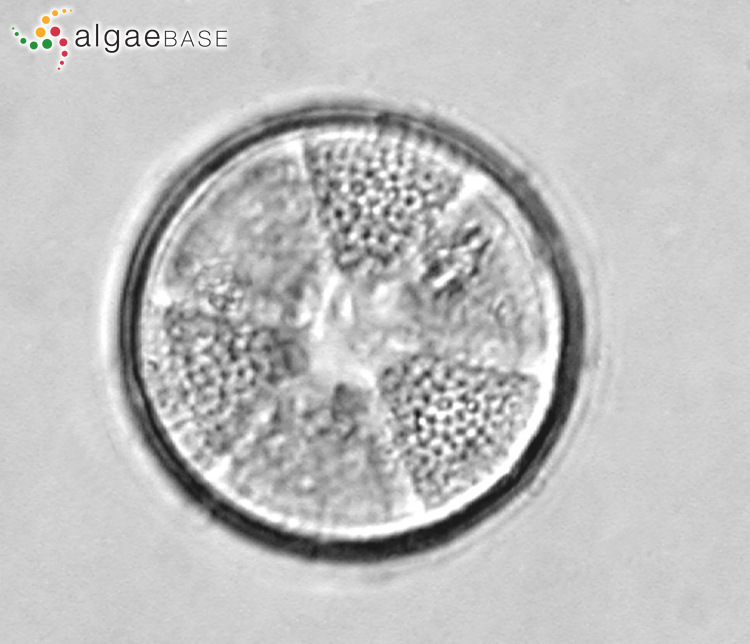 This is the type species (lectotype) of the genus Actinoptychus. Type locality: Algeria: Oran (fossil) (Silva 1996-to date). Emend. Andrews & Abbott Homann, 1991: 34, pl. 2, figs 5, 7, 8; pl. 3, figs 1-5 (Van Eetvelde & Cornet, 2002: 431). Hoppenrath, M., Elbrächter, M. & Drebes, G. (2009). Marine phytoplankton Selected microphytoplankton species from the North Sea around Helgoland and Sylt. pp. -264, figs 1-87. Stuttgart: E. Schweizerbart'sche Verlagsbuchhandlung. O'Meara, E. (1875). Report on the Irish Diatomaceae. Proceedings of the Royal Irish Academy, Series 2 2: 235-425, pls 26-34. Saunders, K., Lane, C., Cook, S., McMinn, A. & Hallaegraeff, G.M. (2010). 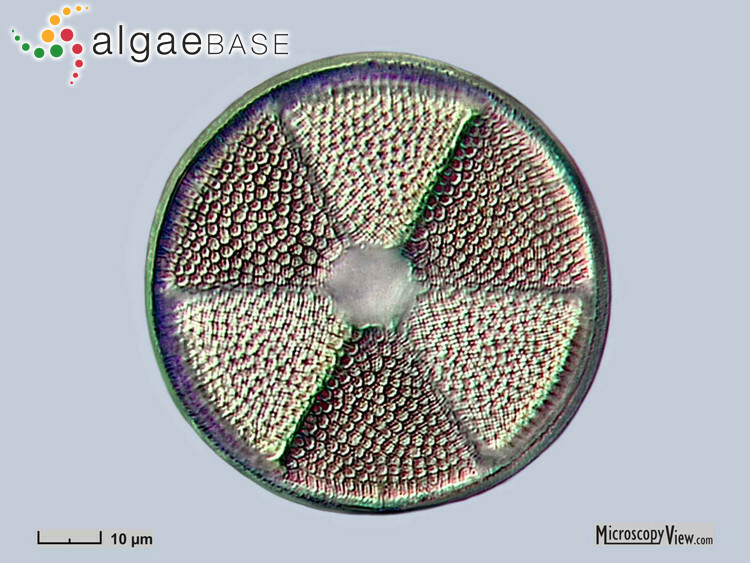 Benthic diatoms. In: Algae of Australia. Phytoplankton of temperate waters . (Hallegraeff, G.M., Bolch, C.J.S., Hill, D.R.A., Jameson, I, LeRoi, J.-M., McMinn, A., Murray, S., de Salas, M.F. & Saunders, K. Eds), pp. 83-144. Canberra & Melbourne: ABRS; CSIRO Publishing. Van Eetvelde, Y. & Cornet, C (2002). Some Eocene species of marine pyritized diatoms in the core of Saint-Josse (France). Diatom Research 17(2): 423-435. Villac, M.C., Kaczmarska, I. & Ehrman, J.M. (2016). Diatoms from ship ballast sediments (with consideration of a few additional species of special interest). Diatom Monographs 18: -557, 235 pls. Witon, E. & Witkowski, A. (2006). 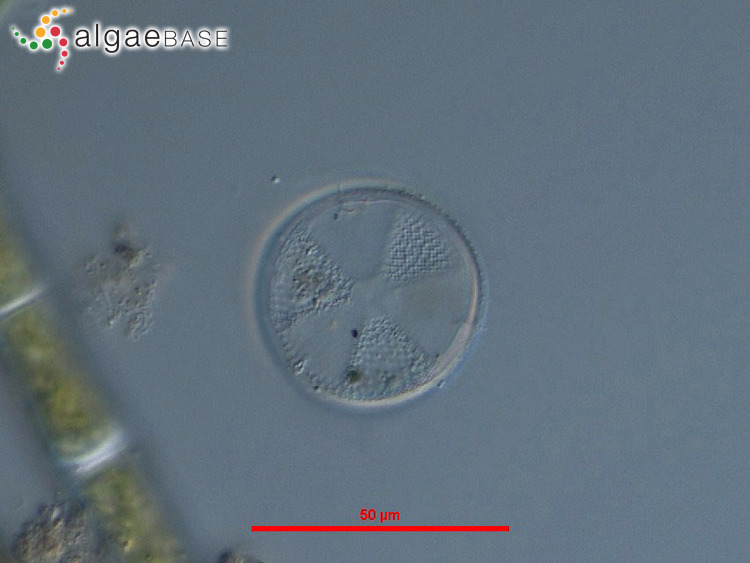 Holocene diatoms (Bacillariophyceae) from Faeroe Islands Fjords, Northern Atlantic Ocean. II. Distribution and taxonomy of marine taxa with special reference to benthic forms. Diatom Research 21(1): 175-215. Accesses: This record has been accessed by users 7891 times since it was created.